De Blasio did not meet Pope Francis, who hosted the event, though he said it was "fun even to be close to him." "The Palace was built in 1400 and was bought by Cardinal Pierdonato Cesi who had it restructured and refurbished, turning it into an antiques and art museum, and installing a well-endowed library," according to the luxury hotel’s website. "Today, the Generalate of the Salvatorians has converted part of the building into an elegant and exclusive ‘welcoming home,’ with 30 rooms all fully equipped with every amenity. Each room is a small cosy haven, furnished with taste and style [sic]." "Here the guests can personally experience the spirituality of this unique place, drenched in history at the very heart of Christendom, with the enormous privilege of being able to stay so close to the Holy Father’s residence," the hotel said. Receipts for the Palazzo Cardinal Cesi indicate that the city paid for two nights beginning on Monday July 20 for de Blasio, even though he did not arrive in Rome until Tuesday morning, almost an hour and a half late to his speech after his flight was redirected and delayed due to fog. A hotel receipt for Abeywardena, who used to work for the Clinton Global Initiative, listed an arrival date at the hotel on July 19, while Carey had a room booked over the weekend, beginning Saturday July 18 through July 22. The total hotel tab for de Blasio and his aides was $3,883.47. Aside from flights and hotel expenses, New York City taxpayers also picked up $292.61 in expenses filed by Abeywardena, which included a $16.45 meal consisting of tiramisu and prosecco. The Free Beacon obtained the receipts through a Freedom of Information Law request for trips de Blasio has taken to Europe during his first term in office. The Free Beacon received documents relating to de Blasio’s vacation to Italy in July 2014, to Paris in January, and the Vatican trip this summer. Flights for de Blasio and his aides to to Paris after the January terrorist attacks on Charlie Hebdo and a kosher market cost $11,091.84. De Blasio’s airfare cost $2,762.40, plus a $10.56 agent fee with Euro Lloyd Travel. Accompanying the mayor were his press secretary Phillip Walzak, his adviser Avi Fink, and Abeywardena. 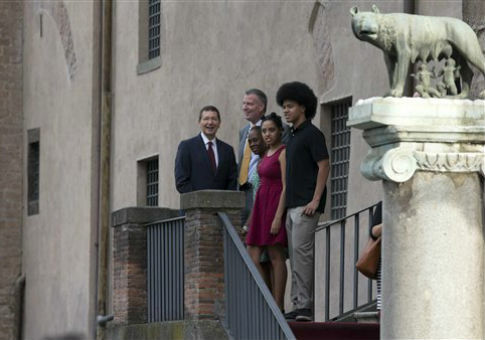 De Blasio paid for his flight to Italy last summer, though taxpayers paid roughly $12,800 for flights and hotel accommodations for several aides who accompanied him on the trip. In all the three trips have cost the city government $41,623.26. This entry was posted in Issues and tagged Bill de Blasio, Government Waste, New York. Bookmark the permalink.